I got to use some cutting edge gear while teaching military members how to avoid and deal with chemical, biological, and radiological contamination. We had laser and spectrometry equipped tools that totaled millions of dollars to help us identify threats. We wore protective suits that cost thousands of dollars while exposed to actual chemical threats. Then, one day in late 2009, they brought us RSDL. We had all of this high tech gear and protection for training and we get ‘pouches of goo’ for decontamination. Well, it turns out that it worked pretty darn well and didn’t cost thousands of dollars when it came time to re-order. What is RSDL? We’ll get to that, how it works, and a few experiences I’ve had with it in this post. 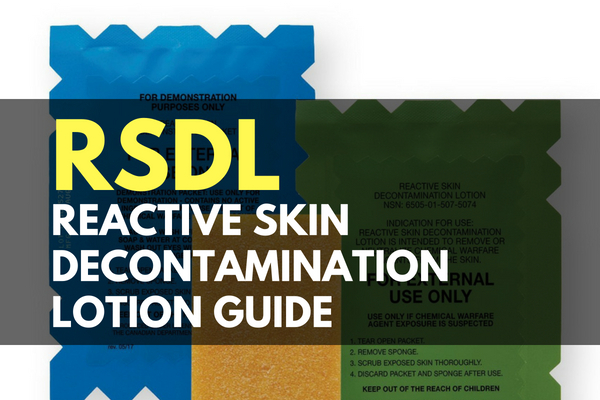 RSDL is an acronym for Reactive Skin Decontamination Lotion which comes in pouch kits for decontaminating direct skin exposure to many types of chemical weapons. It is a relatively new decontamination kit for the military, and a brand new kit as far as general purchase. When you tear open the pouch, you find a gel-filled sponge that absorbs and neutralizes chemicals. It is meant to be applied to bare skin, but can be used on equipment and vehicles as well. The gel has the consistency of honey, so it gets between the fingers pretty good. RSDL replaced the M291 decontamination kit, which is a small activated charcoal pad meant to be worn on the fingers. The large activated charcoal mitt (M295) is still in service. The lotion is considered an upgrade because it is easily washable, less toxic, and is a FDA approved medical device. Users claim, and I can tell you, that it is easier to apply than the charcoal kits. How Does the RSDL Pad Work? RSDL is very simple to use. First you identify contamination. If you do not know how to identify signs of chemical contamination, we’ve covered this topic before. Next, open the packet at one of the notches to remove the coated sponge. Next, wipe the contaminated spot by scrubbing with the RSDL sponge. Finally, rinse the lotion off when you are in a non-contaminated area. Depending on where you get your RSDL kit, it may come with a training sponge in a blue pouch. If it does, I highly recommend that you use the training device so you know how to quickly open, apply, and flush the kit. It will help you know about how much coverage you can get out of one pouch and get used to the consistency of the lotion in the sponge. We give chemical attacks a low risk score in our TrueRisk index, but it is important to differentiate between low risk and no risk. The TrueRisk index is a tool to prioritize the risks; not to ignore them. It seems like a pretty simple process- hop online and grab some from an online vendor. The problem is that RSDL, like many decontamination kits, has a shelf life. I’m always about maximizing shelf life and the best way to do this is through the approved vendor. Not only will you get the most recent production, but you can know it has been stored properly and didn’t cook in a warehouse for a few years. This is the type of gear that you should buy the right way, and not second-hand. The main vendor for RSDL is the Emergent BioSolutions lab, which obviously have the real just-manufactured kits ready to ship fast. Alternatively, if you don’t care about shelf life, you can source RSDL through military surplus sources. Do not use prior to chemical exposure (it doesn’t work that way). Avoid unnecessary exposure. Do not leave on skin for excessive periods. Use training RSDL for training and demonstration purposes. Do not eat RSDL or use RSDL on your eyes. Do not store or combine with oxidizing chemicals, such as bleach. A chemical reaction can occur causing a fire hazard. Most of these warnings may seem like common sense- but people can make bad decisions when presented with threats that they do not encounter often. That is just another reason why training for all situations makes sense. E-Z-EM, Inc was the first manufacturer awarded with the RSDL contract by the Department of Home Security (DHS) in 2007. Emergent BioSolutions acquired them in 2013 which added RSDL to their portfolio of products. Late 2017, Emergent BioSolutions made RSDL available to the civilian population through industrial supply stores and online. 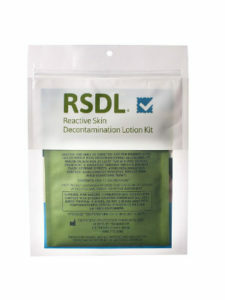 RSDL made our life easier in the military, and it makes a great addition to any specialized decontamination kit. The lotion kit is easy to use, works well, and has a long shelf life. 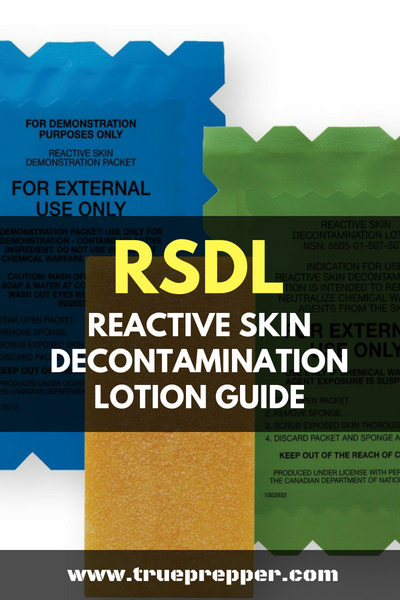 RSDL is a solid decontamination solution that you should consider adding to a specialized chemical kit for additional protection. Like most specialized kits, the chance that you will use them is low but the equipment is simply irreplaceable in the event that you need it. Know the risks in your area, and get the proper equipment to protect yourself in case SHTF. Keep exploring, stay prepared, and be safe.